The Samsung Galaxy A7 (2017) has been spotted on GFXBench. 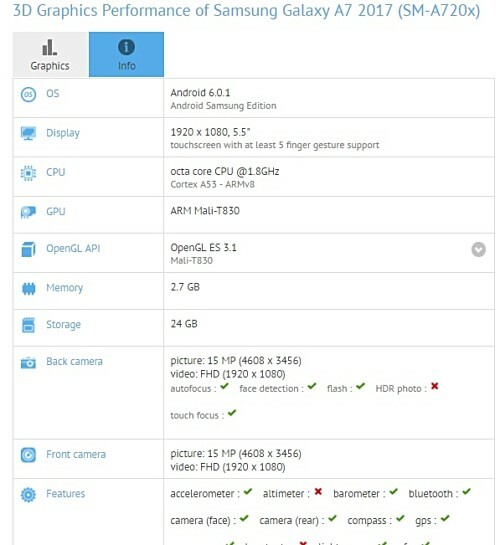 The listing reveals several of the device's key specifications, including octa-core 1.8GHz CPU, 5.5-inch full HD display, 3GB/32GB memory configuration, and Android 6.0.1 Marshmallow. However, the selling point of the handset, as revealed by the listing, seems to be the 16MP front camera unit (the rear unit is 16MP as well). While it's entirely possible for benchmarks to get things wrong, we've rarely seen that happening with camera megapixels, especially on GFXBench. So, assuming that the Galaxy A7 (2017) does feature a 16MP front camera, it's a solid upgrade from the 5MP unit that the Galaxy A7 (2016) comes with. Sadly, pricing and availability information for the device (as well as other 2017-edition Galaxy A series phones) isn't known at the moment. Yup, I just cross checked it. I think it will be called 7870, but has overclocked CPUs. Unfortunately there's no improvement on the GPU side though. You'll get a free fire extinguisher with every purchase of a Samsung device from now on.